Technology Services of Iowa, LLC: Calling all friends and family! Saturday, December 5th, iTech stores will open at 8 AM for a special private friends and family shopping event and YOU are invited! HDTVs, digital music players, digital cameras and accessories, phones, Bluetooth headsets, surround sound, sound bars, computer accessories, RC toys, and huge discounts on batteries! 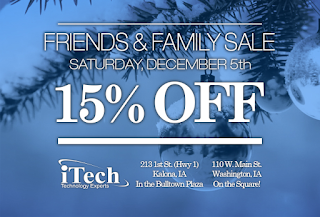 To participate: Mention Friends and Family, Print or show this email to Kalona or Washington iTech staff on Saturday, Dec. 5th or it will be your ticket to exclusive pricing!